We are kicking off Shutter Mission’s free Resources for Photographers section with at Lightroom preset and tutorial for these great mini accordion albums from J. Lee Albums. They are the perfect size for your purse, and clients love showing them off. There are two separate presets in the zip. One is called “mini accordion photos” and the other is “mini accordion window.” Pretty self-explanatory. The larger ones are square photos for inside the album, and the smaller one is for the front window image. We prefer the inside photos to be 2.5″ since the pages are 3″ square, as this leaves a little room around the photo to act as a border. You can adjust this size to be whatever you like. Download the LR Accordion Templates zip file and extract the files to your desktop. In Lightroom, go to the Print Module. On the left hand side, under “Template Browser,” right click (or control-click) on “User Templates” and you should see a menu pop up. Choose “Import” and select the file to be imported. (Screenshot below). 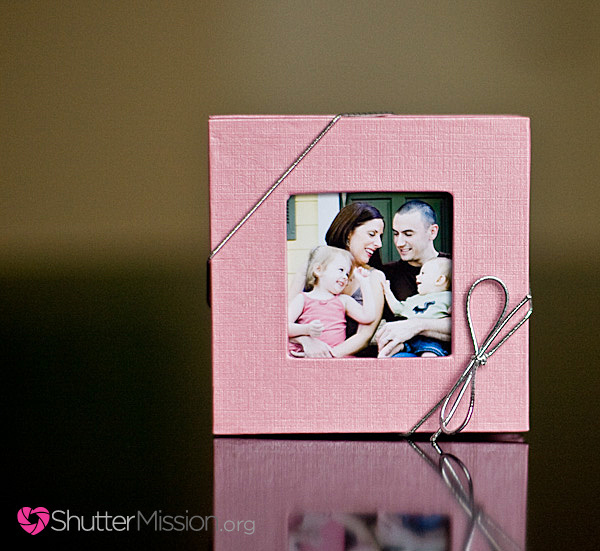 Once you’ve got your photos printed, use an X-acto knife to trim them into squares. We prefer to use acid-free Glue Dots… but you could also go with a glue pen or double-stick tape, depending on your needs. For presentation, use a small silver stretch ribbon to keep the album closed and finish it off. Package in a small organza bag in the color of your choice. We hope you found these presets useful. 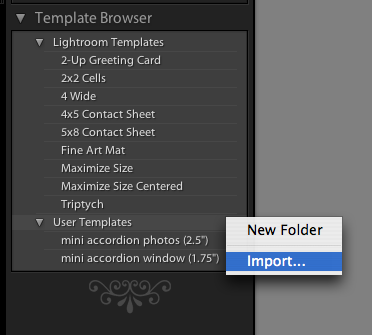 Your LR template for the mini accordion looks great! However, I cannot access the password on your FB page. I tried using “*********” and it did not work. Did I miss something? We are looking into other download managers that don’t require passwords, but for now… give it another try. It should work.